This guitar lesson teaches you the Mr Sandman melody guitar part by Chet Atkins. Check out lessons one and two in this series to get you up to speed. Now you’ve got to grips with the chord progression, and the thumb picking technique, it’s time to add the icing on the cake with the melody. As with everything covered so far, the key here is understanding the basic mechanics, and building on them. Fortunately, there are just two basic techniques to get to grips with when playing melodies; the pinch, and the syncopation. Focus on each until they’re mastered. When learning melodies for songs in this style, the secret is learning it in relation to the bass part. The bass movement is steady, and the melody interacts with it on top. The pinch is the simpler technique, and is the same given when a melody note is played at the same time as the bass note. So on this basic C, play the C root note on the A string with the thumb, while plucking the 1st fret A string with the index finger. These are done together, and the result feels like a pinching motion. The second technique is the exact opposite, where the thumb plays a bass note, then the finger plays a melody note after. This is a syncopation. In the following example I’ve placed a pinch on beat one, then the thumb plays on beat two, the index finger plucks the melody and then the thumb continues on beat three. It may seem like that’s far too simple for such a complex style of music, but that really is 90% of what you need to master this style of playing. Looking at the first few bars of Mr Sandman, the index finger picks two notes to lead the song in, then the melody is pinched on beat one, and syncopated on the and of two. I’ve written the thumb part with wider strokes, ala Chet. 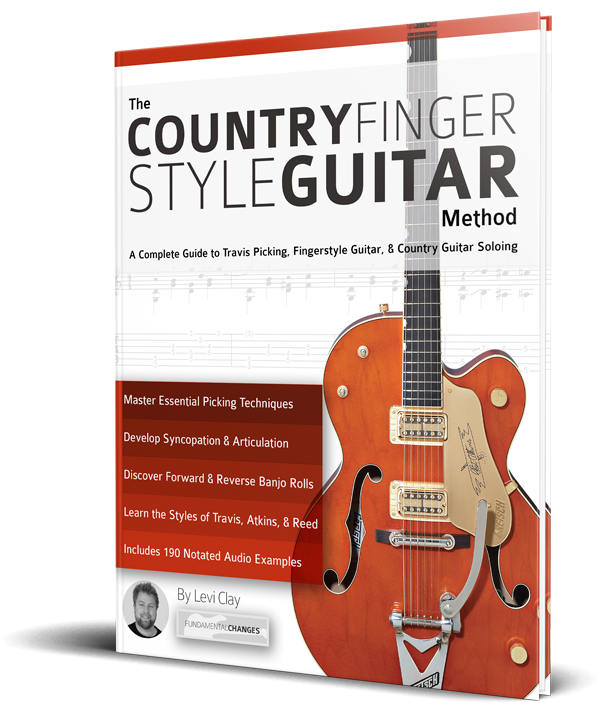 As the chord changes to G#7, the melody falls on the beat, so while the thumb pattern continues automatically as in the last lesson, the index finger pinches notes on the E and B strings. Over the C#9 chord the Mr Sandman Melody is pinched on beats 2, 3, and 4 of the first bar, then on beat 1 of the second bar with a syncopation on the and of 2. For the F# chord, a similar rhythm is played in the Mr Sandman Melody, pinching on 1, 2, 3, and 4, with syncopation in the second bar. Now, this lesson only scratches the surface of the technique, and I cover it in a lot more detail in Country Fingerstyle Guitar, but there’s certainly enough here to give you control of the technique and to play simple arrangements and variation. Check the video out to see, and hear how this is all played, and good luck!